The Small & Mighty Fundraising Minute delivers a quick hit of fundraising wisdom - practical, tactical ideas that you can put to use at your organization. For more tips and tools, Go to pitchconsulting.com to learn about the Small & Mighty Membership program. Ask the kinds of questions that will help donors, volunteers, board members, and others connect more deeply with your nonprofit. Here is why you should not pursue that “Moonshot” donor, the pie-in-the-sky, long shot donor that will never be yours. I’ve also got some tips to help you convince others that it’s not aspirational to pursue such donors; it’s wasteful. Are you working so hard to make things perfect that you are losing out on good opportunities? Is all of your careful planning and analyzing really about achieving excellence, or is it more about control, or fear? How do we avoid making the perfect the enemy of the good? My side hustle - a network marketing company - has taught me a few things about fundraising, and vice versa. There are surprising parallels! Authentic storytelling, turning your donors/board members into fundraisers, thinking more expansively about prospects... listen for more. Tips to Guide Your Year-End Donations! It’s that time of year! The holiday season means parties, trips, gifts, time with friends and family, and… The time of year when many of us make charitable donations. The choices can seem overwhelming. How can you decide where to give, and how much? Here are a few tips to guide and inspire you. You are the CEO of a company: You, Inc. For that company to thrive, you have to invest in it. Financial planning, training, marketing... it’s all part of the big picture! It’s Giving Tuesday! The Super Bowl of online giving. Make a gift, join the fun, and feel your heart grow. 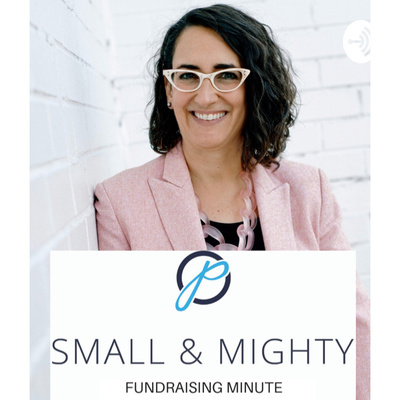 And, if your nonprofit is running a Giving Tuesday campaign, keep your expectations realistic and understand the true value of today’s engagement - listen in for more on this idea. There is one thing you can do for your donors, volunteers, and staff that will ALWAYS be appreciated, doesn’t have to cost you a penny, and will make you feel good, too. Can you guess what it is? Creativity does more than just help your work get noticed. When you practice creativity, you develop the skills that will help you create new solutions and confront challenges in unconventional ways. What do you do when you can’t do it all? At a small(er) organization, you’re expected to do it all. And be good at all of it. But that’s not realistic. Make choices that play to your strengths, and call in support and reinforcements for the rest. Why I kinda hate “elevator speeches,” and what I suggest as an alternative, a better way to engage and build relationships with potential donors and partners. Here is your asking-for-money pep talk! A few ideas to get you beyond your anxiety and doubts, so you can make the ask. You can do this! Given the new tax laws, should you send your organization’s annual, year-end fundraising appeal at the end of the year? Or should you send it at another time, so you can stand out from the pack? Five Important Things: a writing prompt to help you enliven your writing and bust through writers block. Ask for Money or Advice? There is an old adage in fundraising: Ask for money, get advice. Ask for advice, get money. Which should you do? What are the hidden costs of your fundraising event? Corporate Giving or Corporate Sponsorship? What’s the difference between corporate giving and corporate sponsorship? Which is right for your organization or event? What’s a 990, and What Should You Look For in There? You may have heard people talking about a charitable foundation’s “990.” What is it, why does it matter, and what is the most important thing to look for in that document?